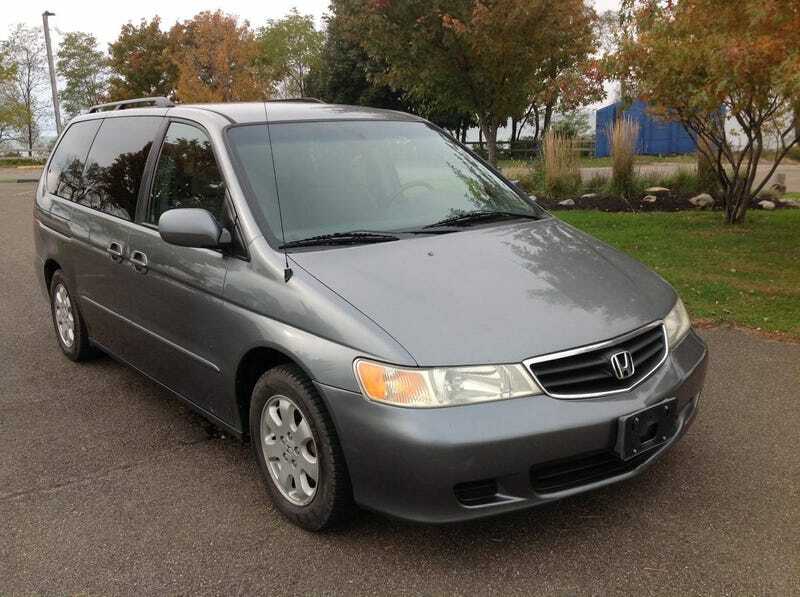 At $6,000, Would Buying This Stick Shift 2002 Honda Odyssey Be a Total Trip? The second generation Honda Odyssey gained a reputation for having crap automatic transmissions. Today’s Nice Price or Crack Pipe ’02 solves that problem by replacing the slusher with a stick. Could that make its price automatically appealing? Do you find certain movie tropes maddeningly frustrating? You know the ones I mean. In horror movies they always have someone going into a dark basement when that’s obviously a dumb choice, while rom-coms try and make us believe that a main character can’t see that their best friend has been the obvious choice all along. Jeesh! You can add to those the plot-line pitfall that would be the purchase of last Friday’s 2004 Volkswagen Phaeton W12. It may have been a tantalizingly desirable ride, but you just know that it’s going to go after your bank account like a Heffalump on a honey pot. Most of you agreed, and fully 73 percent of you felt its $20,000 asking was too steep a climb to start the slide. Its Crack Pipe loss was a sad but perhaps inevitable final act. Fade to black. Let’s consider for a moment the schism in transmission choices between the European Union and the United States. In the EU more than 80 percent of automobiles sold in 2017 came with some sort of manual transmission. In the US, that was closer to 4 percent. I mean, you’d get the impression that the Europeans are all more industrious, capable and coordinated than us. Hell, the last time I was in Greece, the 50-seat motor coach that took us from Thessaloniki to Vergina was a stick shift. In America, I think even the Batmobile rocks a PRNDL. That seems to especially be the case with minivans here. We’ve had very few people movers that offered manual transmissions. The original Volkswagen Bus did, as did the first wave of Chrysler minivans. Toyota’s Previa would let you row your own, but that option went away with the Sienna. Honda, throughout their three generations of Odyssey minivans has never given you a stick. More’s the pity since the 4-speed and 5-speed automatics in the Odyssey’s second generation earned a bad rep for shitting the bed early and often. Honda responded to the Odyssey’s transmission woes by extending the warranty, replacing the 4 cog box with the redesigned 5 gear unit mid-run, and eventually slapping Ford emblems on the effected models when they came in for service, telling owners they’d have to take them to the Blue Oval shop down the street. Don’t hold me to that last bit, I may have just made it up. The owner of this 2002 Honda Odyssey took a different approach to the van’s potential trans troubles. He eliminated the auto entirely, replacing it with a 5-speed stick and three pedal arrangement in the funzone footwell. Offered up in a gray on gray color scheme, the van appears completely unassuming from outside. With 134,000 miles on the clock, it also seems to be in pretty decent shape visually. The headlights do seem to exhibit some yellowing in the pics, but the paint looks like it’s still holding a shine and the factory alloys seem reasonably free of curb rash. New Hankook (not Hannoock) tires are fitted and behind those apparently sit new KYB struts, H&R springs, and new ball joints and brake bits. It’s the transmission that’s big story here, however. The Odyssey’s platform is derived from that of the Accord and hence there’s a lot of parts the sedan could offer that do fit the van just fine. The transaxle is one of those although there may have been some custom work needed to mount the box in the Odyssey. There certainly was some fabrication needed to add a manual shifter to the dash, that’s for sure. A charcoal-colored box extends from the center stack and out of that sprouts a stubby shifter that looks well positioned for what it’s called upon to do. The switch to stick doesn’t look factory, but it doesn’t look half-assed either. The seller says the work was done by Auto Imports as though that’s supposed to mean something. At least it wasn’t done in someone’s backyard and “just needs some adjustment to be right.” Instead, the seller says the van “Runs and drives like better than new!” and that the 3.5-litre VTEC V6 goes like a champ. Who would want a manual-equipped minivan? Well, how about a European ex-pat? Or maybe someone here who has a crowd to carry, but still likes to maintain a DIY attitude? Whoever the audience, it’s a sure thing that this oddball Odyssey will be a point of conversation at soccer matches and private school car lines alike. What we need to decide is whether its $6,000 price tag is worth bragging about too. What do you think, is this unique manual minivan worth that kind of cash? Or, is the seller trying to stick it to us in more ways than one? Rochester, NY Craigslist, or go here if the ad disappears. H/T to drdanteiii for the hookup! Help me out with NPOCP. Hit me up at rob@jalopnik.com and send me a fixed-price tip. Remember to include your Kinja handle. Would You Drop $20,000 to Play Let’s Pretend in This 2004 VW Phaeton W12? At $3,300, Could This 2003 Ford Focus SVT Be a Hot Hatch That’s a ‘Natch? At $7,499, Could This Kermit Colored 1974 Fiat X1/9 Make it Easy Being Green? At $11,000, Is This Excellent-Seeming 2004 Subaru Forester XT Turbo Also an Excellent Buy?